In a sauce pan over medium heat- simmer the apple cider until it’s reduced to about 1/3-1/4 of a cup (should take about 20-30 minutes.) Then set aside to cool. In a bowl of stand mixer fitted with a paddle attachment (or using a handheld electronic mixer) cream together the butter & sugar until light and fluffy. Add the eggs one at a time, then the vanilla. mixing thoroughly between. Use a spatula and scrape down the sides of the bowl until fully combined. Reduce the mixer speed to low & slowly add in the buttermilk & chilled apple cider reduction - mixing until just combined. Add the flour mixture about a 1/3 at a time- being careful to not over mix. Turn the dough out onto a floured marble slab or clean counter & gently flatten/roll until the dough is about 1/2 inch (or a little larger) thick. Using a doughnut cutter (or DIY it with a 3 ½ inch cookie cutter and a smaller (around 1 inch) cookie cutter) cut out doughnut shapes. Transfer the doughnuts to a baking sheet and refrigerate for about 15-20 minutes or until the dough is chill to the touch. In a deep heavy bottomed pan (I use a dutch oven) heat about 4 cups vegetable oil (about 3ish inches deep.) Using a candy thermometer - heat on med/high until the oil reaches 350°F. Prepare a baking sheet/cooling rack lined with paper towels to transfer finished doughnuts to. When the oil reaches 350°F, using a slotted spoon, CAREFULLY place doughnuts into the pan a few at a time being careful not to over crowd. Fry on the first side for about 1 minute, flip over and fry the other side for 30 seconds to a minute or until golden brown. Place the fried doughnuts on the prepared towels & drain until cool to the touch. 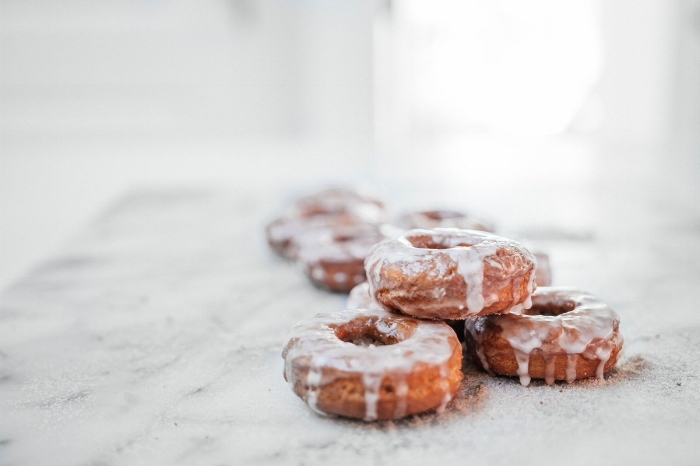 While the doughnuts are still warm, dip them in the glaze, or roll them in cinnamon sugar & serve immediately.